Once a Congress project, Sachar Report is now a tool for BJP to beat it with. The UPA during 2004 to 2014 tried to create divisions in the Indian society to reap electoral gains. (It)… had constituted Sachar Committee for Muslims and was trying to make changes, which were extra-unconstitutional. A fabricated narrative in the name of ‘Saffron Terror’ was developed by Congress government in order to consolidate Muslim votes. This response is not at all unanticipated. The Bharatiya Janata Party (BJP) has always been critical of what it calls ‘Muslim appeasement’. And the constitution of a commission by former Prime Minister Manmohan Singh specifically for Muslims goes well with the party’s rhetoric of ‘vote bank politics’. Yet, this observation is not entirely correct. Narendra Modi government’s ministry of minority affairs still recognises the Sachar Report as an important ‘source book’ for its schemes. The ministry this year submitted an ‘action taken report’ to both Houses of Parliament with regard to implementation of the Sachar Report. The 15-point programme introduced by Manmohan Singh for the welfare of minorities is still treated as a fundamental principle to deal with the exclusion of minorities in general and Muslims in particular. The ministry’s website also features a report (commissioned by the GoI in 2016) on the impact of these 15 points on minority communities. 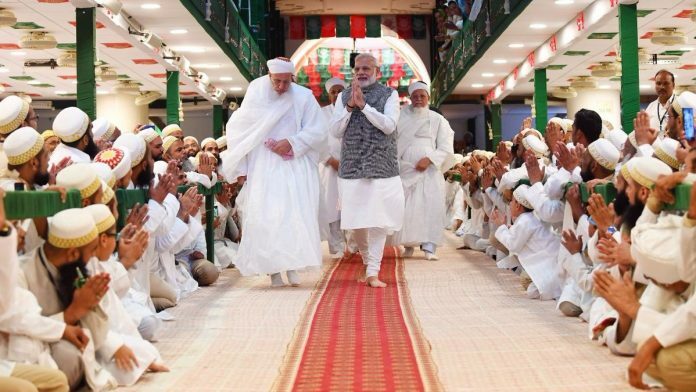 Does it mean that Modi-led BJP is also involved in Muslim vote bank politics? These apparent contradictions actually point towards two basic questions. First, is it possible to read the Sachar Report as a political project? If yes, what is nature of this politics, which primarily revolves around the issues of social justice, backwardness and underrepresentation of Muslims? The dominant view is that the idea to have an official commission to examine the socio-economic backwardness of Muslims originated in 2004, when Manmohan Singh was sworn in for the first term. That is factually incorrect. Muslim backwardness as a political category began to take shape in the late 1980s. The Mandal Commission evolved a method for identifying OBCs among non-Hindu communities. It paved the way for the inclusion of a few Muslim backward castes in the OBC list. The rise of Muslim Pasmanda (marginalised) politics was the obvious outcome of this development. This new kind of Muslim politics questioned the caste-based social stratification among Muslims and demanded that Muslim Dalits be included in the Scheduled Caste category. The National Commission to Review the Working of the Constitution (NCRWC, 2000), which was set up by the Atal Bihari Vajpayee government, submitted the first official report that recognised Muslim backwardness as a policy concern. It argued that ‘backward classes belonging to religious minorities … should be taken up with special care’. At present, the political representation of minority communities in legislatures, especially Muslims, has fallen well below their proportion of population… This can lead to a sense of alienation. It is recommended… that … political parties to build up leadership potential in the minority communities… The role of the state for strengthening the pluralism of Indian polity has to be emphasised. There is virtually no difference between the suggestions given by the NCRWC and the recommendations of the Sachar Commission Report. In fact, the basic premise of the Sachar Report stems from the NCRWC, which strongly advocated for inclusion of all marginalised groups in the public policy discourse. Interestingly, political parties treated these official reports as political objects. The BJP appreciated the NCRWC report wholeheartedly, but found it difficult to accept Sachar Report. Similarly, the Congress remained sceptical about NCRWC, but highlighted the Sachar Report as its achievement. And then, the story of Sachar Report gets a new twist in recent years. The Congress has completely disassociated itself from it. The party’s manifestos for the recent assembly elections are virtually silent about the recommendations of the Sachar Report. The leaders of the party are now very careful about the use of the word Muslim. For instance, the Madhya Pradesh election manifesto (which is called vachan patr) employs the term aplsakhyak (minorities) for addressing Muslims and clubs it with pichra varg (backward classes) in order to make a few general promises about their development in the state. The Sachar Report, it turns out, can now certainly be described as a context-driven political project of the Congress, which has lost its symbolic electoral capability. The Congress does not want to rely on the narrative of Muslim victimhood because it might upset its own version of Hindutva. Two crucial political aspects may be traced behind these shifting positions of political parties. First, the constitution of the Sachar Commission helped the UPA government and the Congress elite to recreate and sustain ‘Muslim’ as a legitimate political category. The report was used by the Congress to mobilise Muslims as beneficiaries (though they were nothing but an object of an academic analysis). For the Hindutva forces and the BJP, the Sachar Report was an evidence of Muslim appeasement, which was to be employed to secure the Hindutva vote bank in 2014. Second, the Sachar Report has an official status. It is an authoritative official account of Muslim marginalisation, which is deeply rooted in public policy discourse on social justice. It is a compulsion for the government to follow it through at the ministry level. The BJP uses this administrative obligation differently. Unlike the Congress, it does not celebrate the ministry of minority affairs. Instead, the BJP wants to retain the Sachar Report – primarily because it can always be used as an evidence to justify Hindu-victimhood politics. After all, the Sachar Report gives a Sarkari status to all Muslims.